After completing our backyard garden paver stone project, we've had much more usable space and a reduce amount of dirt/gardening space. All in all, that project was a complete success and has even given our dog more areas to run without getting completely dirty and dusty paws. But now that our dog has more space to run, we leave him outside more during the day and during dusk and dawn. The problem is, we have problems watching over him from inside once it gets too dark. The easiest solution was to find the brightest landscape lights available for a reasonable price. All too often, I see homes with very dim solar path lights leading up to the front door. Even though those lights can be purchased at a fairly good price (often times 5-6 solar lights for $30-40) want to avoid this in my backyard to avoid having a solar lights every 3-4 feet just to light up the backyard. Instead, I was looking for the right garden lights to sufficiently light up the backyard. Based on what I learned online, the key to bright LED lights is the number of lumens, which is the amount of lights emitted. Solario Garden Decor Solar Powered Lights costs $24.99 for 10 lights, but each light is only 7 lumens. SolarGlow LED Garden Lights cost $36.99 for 6 lights, but each light is only 10 lumens. Hampton Bay NXT-1903P-6pk LED Solar Pathway Lights costs $29.44, but each lights is only 1.2 lumens. So after extensive online searching, I found the brand Moonrays, specifically their 91754 Richmond Solar lights as pictured above. Even though they're more expensive ($30.77) than the lights above and only come in a 2 pack (2 lights per box), each light is 30 lumens! Due to the price, I ordered one box so I could compare it to some of the cheaper lights I borrowed from my family. The Moonrays were very bright (though they have a split light pattern which you may more may not like). It's worth noting that the Moonrays were also much higher quality, as the LED was behind glass instead of plastic. People breaking the cheap plastic spike that goes into the ground. Of the 8 lights I purchase, I admit minorly crack one of spkes. Luckily it was still strong enough to support the weight of the light. I figured this would be a good opportunity to contacting customer service. They replied, directed me to 3rd party site that sells the stakes for $2 each, but with $11.08 shipping. I chose not to rate it and would knock off a star for not fully supporting their product. The second biggest compalint was the short lifespan per charge, though my lights are on for at least 7 hours which is enough for me. Other users suggested swapping out stock batteries with high capacity batteries. Based on my usage, I was satisfied with the nightly lifespan per charge. After confirming the Moonrays could be sufficiently charged by daylight in all areas of my backyard, I decided to order 3 more boxes to bring my total lights to 8. 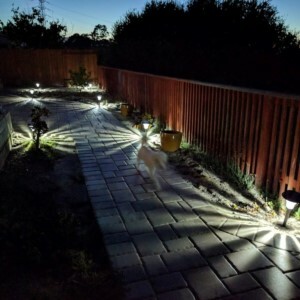 We now feel comfortable to free our dog and let him run around the backyard at night because with the Moonray solar powered lights, we can easily monitor him at all times.